This is a WONDERFUL resource of 14 fall party craft ideas for kids! Are you hosting a harvest party this year? Or maybe a boy’s autumn birthday party? Fall is a delightful season to celebrate with friends. Autumn colors provide the decorations so you just need a few party supplies, a themed dessert table and something fun for the kids to do. That’s where this round-up comes in. You’ll be inspired to do several crafts with leaves, including leaf rubbings, ghost leaves, painted leaves, stamped leaves and a harvest crown. There’s a cute paper bag scarecrow, how-to make woodland creature masks, a sunflower card, and pony bead pumpkins. Going on an explore to make a found fall treasure box would be delightful. Making animals and fish with leaves: genius. Tired of all those messy Legos everywhere? These 8 DIY Lego Travel Cases to Keep Your Organized are perfect to keep them all together. Get ready for fall and Halloween with 28 of the Best Pumpkin Decorating Ideas. Create these fun Duct Tape Backpack Charms with your kids. Take a look at these 11 Thanksgiving Handprint and Footprint Crafts Your Boys Will Love. 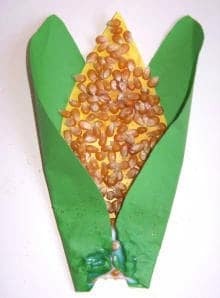 Celebrate the excitement of fall harvest by engaging kids in this creative corn collage craft. You’ll need green and yellow cardstock or construction paper and plenty of unpopped and popped popcorn. Because the temptation to eat the art supplies (popcorn) will be great, consider having extra popping corn on hand for eating too! Little hands will have fun gluing popcorn kernels in place for this great fall party craft! A fall party is always so much more fun with a great fall craft activity. Kids will love learning how to make woodland creature masks using this fantastic tutorial and free printable mask templates. The tutorial and pattern takes the guesswork out of the mask making, leaving you with the simple task of rounding up the materials: foam sheets, pipe cleaners, paper straws, scrapbook paper, scotch tape, glue, brown marker, X-Acto knife. An exploration of fall isn’t complete without learning about scarecrows! Kids will enjoy making these paper bag scarecrows from simple materials you probably already have laying around your home. You will need: paper bags (brown or white), construction paper, yarn/string, glue, markers, scissors, and newspaper, paper or paper towels (for the stuffing). The resulting paper bag scarecrow will make a darling addition to your fall decorations. 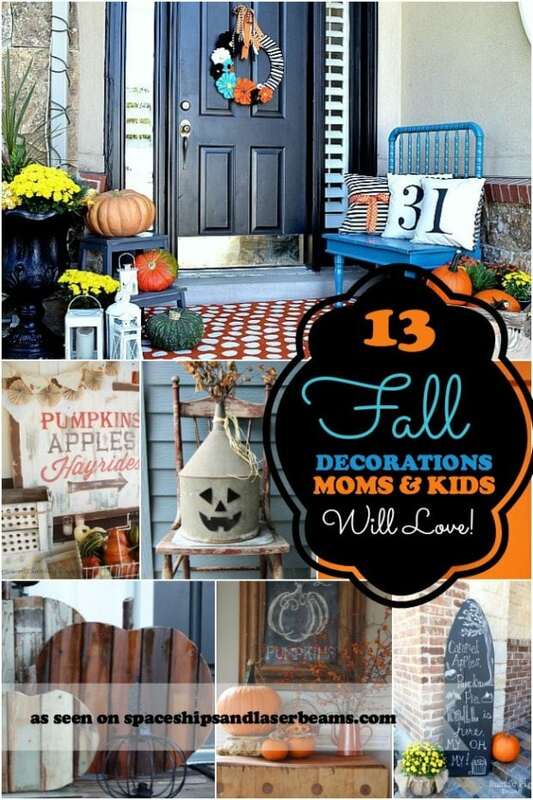 Any fall craft that utilizes some recycled materials is already a winner in my book. This fall tree craft features recycled paper towel rolls that are painted with brown paint to serve as trunks for beautiful fall-leaved trees. Inexpensive packages of faux leaves can be found at dollar or craft stores. Kids can paint the base (ground) that their trees will stand on while their tree trunks dry. Leaves are then added to the tree trunk. Deciding where to display these cute fall tree decorations may prove to be the hardest part of this craft! Simple fall party crafts will save your sanity, so be sure to take note of this great frosty leaf ghosts idea. Two materials are all you need—white faux leaves (or substitute white paper leaves) and a black permanent marker. To make ghost leaves you simply add oval shaped eyes and a round mouth to your white leaves. Boo! This would make a great fall Halloween party activity. There is nothing quite like leaves in the fall! Once they begin to fall from the trees, collect a bunch for this perfect fall party craft! In addition to leaves, you’ll need washable paint in fall colors, paper, and paintbrushes. Party guests will add 3-4 colors of paint to the back side of their leaf before carefully spreading the paint with a paintbrush. Once the leaf is coated, you’ll make a leaf print by pressing it on paper. You’ll have your own fall leaf masterpiece showcasing the leaf’s natural vein patterns. Frame it to decorate your house for the fall season. A great craft for celebrating Thanksgiving, this sunflower card is a perfect way for kids to remember the day. Set up this great fall party craft by gathering construction paper (orange, yellow, and green), white glue, sunflower seeds in shells, scissors, and a pencil. Kids will have fun folding and layering construction paper, adding multiple sunflower seeds to the center and exploring the fun paper crafting. The resulting card is eye-catching and fun to touch! Need a fun, fall or Halloween kid party craft? Kids will have so much fun stringing the beads on these pony bead pumpkins. You only need a couple of supplies—orange pony beads and orange, brown and green chenille stems. The tutorial is easy and only requires a few simple twists of the pipe cleaners and stringing of beads. Get kids excited for the fall season by having them craft this colorful fall tree craft using a toilet paper roll and paint. This is a great craft for all ages, but does require a few simple cuts of the toilet paper roll which will be bent to create a leaf shape for printing with paint. Leaves come in so many different sizes, shapes, and colors, perfect for combining in new and unique ways to create art. Fall party guests can use their imaginations to create any of the fall leaves projects featured in this example, including an assortment of animals like elephants, owls, and giraffes. You only need a few things to make these harvest (king and queen) crowns: fabric leaves, cardstock, scissors, and adhesive or staples. The ages of the children making the harvest crowns will determine how much adult involvement there needs to be using the scissors, stapler and/or glue gun. The kids will love creating their leaf patterns and wearing the finished crown during the fall party. The beauty of this fall party craft is in its simplicity. Collecting the leaves—one of the main materials needed—can be part of the fun. Go on a leaf collecting scavenger hunt. Next, kids will need broken crayons with the wrappers removed. Finally, they will need a paper surface on which to make their leaf rubbings. This could be the inside of a paper grocery sack, butcher paper, or even cardstock. Fall party guests who are up for a little nature/adventure walk will be excited about this “finding fall” box craft. The great news is the craft utilizes recycled materials like old catalogs/magazines, scraps of craft paper/scrapbook paper, brown paper grocery bags, and cardboard food boxes. The box is filled with items the kids find on their “finding fall” walk. Items could include things like pine cones, leaves, seed pods, and acorns. Essentially, guests will be making their own display box to show off all the things they found to represent fall. Help your fall party guests create a beautiful autumn wreath using items they collect during a lovely nature walk outside. The kids will love the thrill of hunting for fall items and collecting them for their special craft project. When they return with their fall treasures, they can arrange and glue them on a wreath-shaped piece of chipboard or thick cardboard.